Crochet Pattern Instructions include everything you will need to create the crochet design, including the type and quantity of crochet thread, hook size, tension and complete row-by-row instructions. There are a large variety of Crochet Patterns available. A good place to start is the DMC Club for Free Patterns and the Inspiration section on this web site. Other places include your local Newsagents, Craft Store, book stores, and DMC Stockists who have a large selection of crochet leaflets, books, and magazines like Inside Crochet magazine. Projects for first-time crocheters generally use only one or two basic stitches. They use thick threads and large hooks that are easier to work with, rather than fine threads and small hooks. Garments in this category are simple shapes. A simple one-colour scarf that uses a size 3 Petra or Natura Just Cotton crochet thread would be a good beginner project. 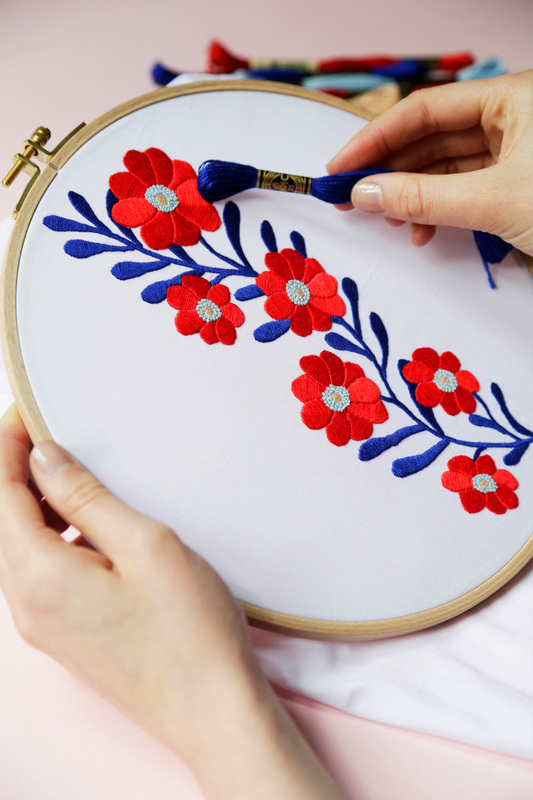 These projects often use two or more colours and may call for a finer thread and smaller hook than beginner projects. Easy level projects can use the same thread and hook as a beginner project, but may include a series of moderately complicated stitches. They may also take more time to complete than beginner projects. A good project in this skill level would be a multi-colour striped scarf using size 5 thread such as DMC Petra. These projects require more crochet experience than easy projects and use a variety of techniques and more complicated stitch patterns. 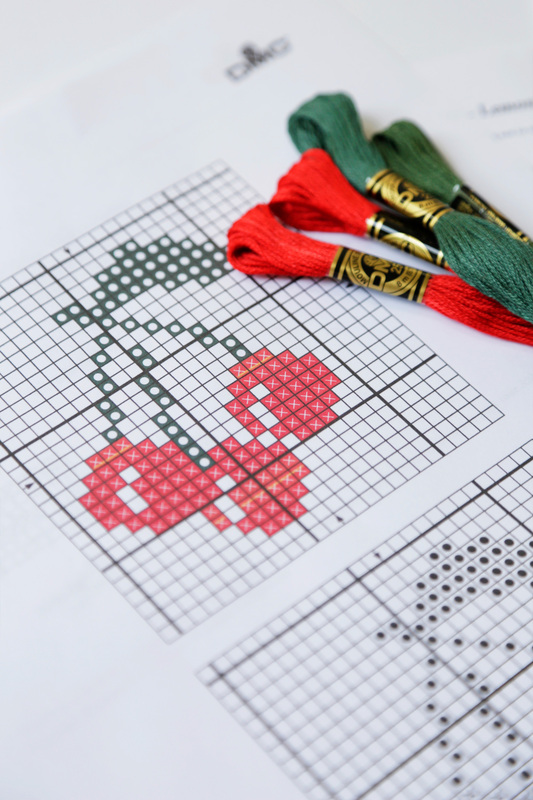 Intermediate projects may have colour changes more often than easy projects, but their degree of difficulty generally depends on how difficult the stitch patterns are. Once again, the patterns may call for threads and hooks of all sizes. Garments need shaping and may call for buttonholes and other details not found in easy projects. A good project for this level would be a cardigan sweater with a V-neck that uses 3 or more stitches with bust shaping, buttonholes and a picot edging. 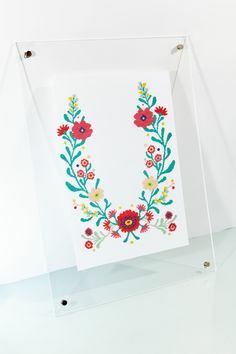 These projects have intricate stitch patterns, techniques and dimension such as non-repeating patterns and multi-colour techniques. They call for fine threads and small hooks. Garments generally have more increases and decreases in stitch counts to produce detailed shaping. They generally have detailed finishing stitches. A project for this level would be a form-fitting, lacy sweater that uses a lacy stitch pattern, size 20 thread and has buttonholes and inset pockets. In the UK the instructions are written row-by row or round-by-round with the help of abbreviations, symbols and terms. Instructions written in other countries usually use charts and symbols rather than row- by-row written instructions. 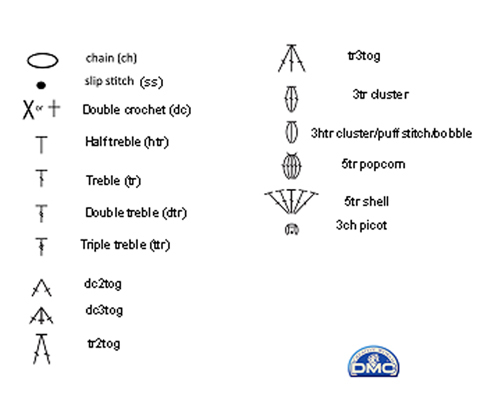 Most crochet instructions are written using a standard set of abbreviations and symbols. Pattern instructions in the form of charts and symbols are universal and simple and easy to read. Below is a sample chart with symbols and a basic explanation on how to read it. Reading written pattern instructions is relatively easy once you get used to the abbreviations, symbols and terms. Listed below are a sample instructions and their explanation given in italics. Ch a multiple of 6 + 2 for each inch of edging needed. Row 1: dc in 2nd ch from hook and in ea ch across, ch1, turn. You will be making 6 heart motifs. Make 6ch per heart motif for a total of 36ch plus 2 additional ch for a grand total of 38ch. Row 1: Insert your hook into the 2nd ch and make a dc. (Tip: Do NOT count the loop on the hook as it is a part f the 2nd ch). When the dc is complete, put your hook in the next stitch and make another dc stitch. Continue to dc in each stitch across the row. At the end the hook will be at the right end of row. With a little practice, a crochet chart is easy to read and follow. Once the symbols are familiar to you, you can see the entire patterns at a glance. No more losing your place in lengthy row-by-row written instructions. - This chart is very clear, because it's easy to see that the pattern is a heart with a ruffled border around it. - For this Heart Border, read the chart from the solid black triangle at the bottom point of the heart up to the top. To the right of the black triangle, which is the starting point, there are 3 blank circles. Each one represents a chain stitch. These 3 chains are the foundation row. - The first row includes 3 capital Ts. Each capital T represents a half treble crochet stitch that is to be made in each one of the 3 chains in the foundation row. - The second row shows 2 capital Ts coming out of each half treble crochet stitch (or capital T) in the first row. 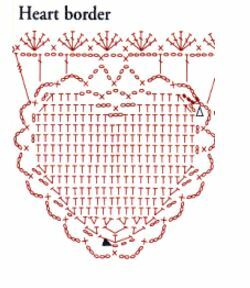 Therefore, make two half treble crochet stitches in each one of the half treble crochet stitches in the first row. There are now 6 half treble crochet stitches in the second row. - Continue to read the chart to the top of the heart. Then add the border by following the chain and double crochet symbols that surround the heart. Right front, right sleeve, right shoulder: These all refer to the actual body part on which the piece will be worn – the right arm, etc. The same applies to left front, left sleeve, left shoulder. Back loop/ Front loop: Back loop refers to the loop of the stitch you are to work in farthest away from you; front loop is the loop closest to you. Continue in Pattern as Established: Usually refers to a pattern stitch and means to continue working the pattern in the same way you were up to this point, and working any increases or decreases in such a manner that the stitch pattern remains the same. Tension/Gauge: Refers to the number of stitches and rows you need to have per inch in order for your project to turn out the same size as the pattern. It is usually given in a 10cm (4”) range, and the pattern will tell you which stitch is being counted. Join: Refers to the slip stitch used to join two stitches as indicated in the pattern. Left Front: Refers to the part of the garments that will be worn on the left side. Left-Hand Side: Refers to the side nearest your left hand as you are working. Multiple: Stitch multiple usually refers to the number of stitches required for a specific pattern repeat. For example, if you were stitching a row of pattern repeats which took six stitches each, your pattern would note you were working in a multiple of 6. When starting a project, you will often see a line like “Ch a multiple of 6 + 2”. You almost always have more chains in your foundation than stitches in the first row because of a beginning or ending stitch, or a turning chain being needed. In the example above, if I wanted ten repeats of the stitch, I would chain 62, or 10 x 6 = 60 + 2= 62. 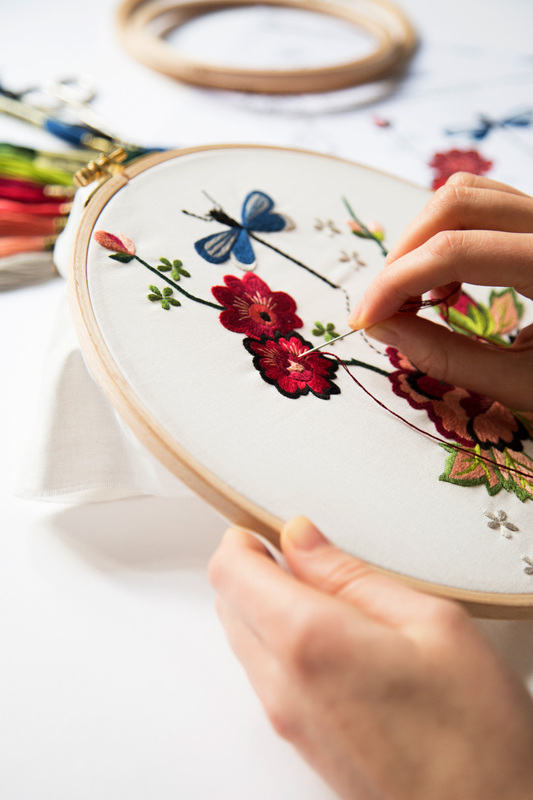 Post: Refers to the vertical part of a completed stitch. Right Front: Refers to the part of a garment that will be worn on the right side. Right Side: Refers to the side of the crochet piece that will be displayed. Right-Hand Side: Refers to the side nearest your right hand as you are working. Turn: Refers to turning the crochet piece over to the reverse side to begin a new row. Work Even: Refers to working in the same fashion without increasing or decreasing. Wrong Side: Refers to the side of the crochet piece which will be hidden.